The battle between Schumi and de la Rosa swung first one way and then the other, but only one can progress to the next round. They'll meet the winner of this - our sixth heat in the first round. 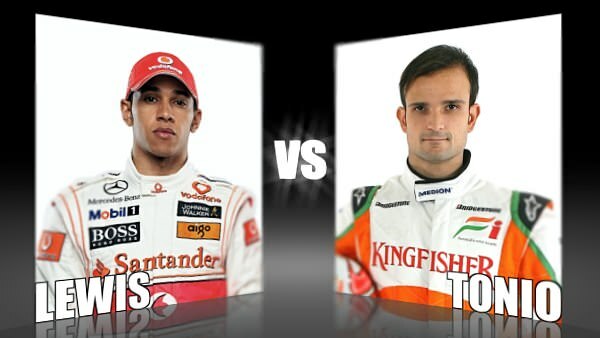 Today we're putting McLaren sweetheart and former champion Lewis Hamilton against the ever so fashion forward Tonio Liuzzi. Hamilton has the Schumacher ability to divide fans into two distinct camps - best driver ever, or worst thing since... well... Schumi. His early seasons in F1 were very tense. The pressure was on him to do well and we all forgot that he was brand new to the sport, thanks to how highly the entire paddock spoke of him. Now, a few years on, he's coming into his own, relaxing and enjoying himself, and it's really starting to show. The fact that Liuzzi survived his Toro Rosso years with a full time drive, amidst all the seat-sharing and driver swapping that went on, must say a lot about his character. He was actively encouraged to stand out and be an individual, part of the Red Bull way of life, but now that he's with Force India, he appears to have reigned back on the intense fashion statements. From what I've seen of him, he's generally quite smiley and happy to sign things for the fans, but will he get your votes today?